Each one of my drawings begins with a single mark — a line that traces a pre-determined framework of circles, or a simple singular gesture. This first stroke defines the direction in which the entire drawing will evolve — each line is a direct response to the mark made just before. These marks amass to create an image which is both still and moving, ordered and chaotic, both pointing toward perfection and also wholly imperfect. For many years I made drawings that were based on simple, pre-determined systems. My goal was to make works that were undeniable; rules and math seemed like the key components for making drawings that had at their core the goal of certainty. Since that time, however, I have found that intuition and openness are my allies — uncertainty is the path that I now follow. To this end, I have been making drawings that rely on the constantly shifting nature of experience and what I call the “unplanned imperfect”. An important part of this practice is the idea of giving each moment my full attention. My focus has been on the process and the labor, less about the image and the object. As my earlier, more mathematical works depended on a set plan of action, the current works rely on letting go of pre-conceived ideas of how the works will develop, allowing the drawings to evolve independent of expectations. But what would happen if I truly and completely let go of expectations? We absolutely must leave room for doubt or there is no progress and there is no learning… People search for certainty. But there is no certainty. People are terrified – how can you live and not know?… You only think you know, as a matter of fact….It is possible to live and not know. When I take these ideas to the extreme I am left to question some of the most basic intentions of my practice: how important is it to resolve the drawing, to know that I will make a finished work of art? What if there was, by design, no resolution? What would it be like to tolerate the doubt and uncertainty in a project that discards entirely the idea of an ending point? And what level of attention would that require? What would it be like to completely let go of expectations and boundaries? Finishing a drawing is not an end point — for me it simply represents the beginning of the next piece. 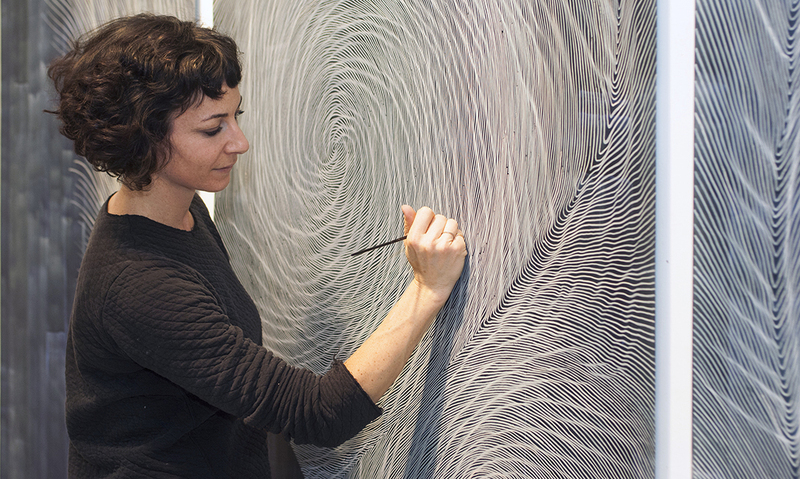 Linn Meyers’ art began with landscape imagery. Her works no longer are literal descriptions of the physical landscape; they have become pure linear abstractions. Yet these drawings have by no means lost touch with the world. Her networks of lines evoke the forms of the landscape –landforms, clouds, and water. But the aspect of human experience Meyers takes as her subject now is the one that is central to her life: the sensation of drawing. Her work is all about her personal experience of reaching, touching, and mark making. She shapes the growing work in response to what she feels and sees while making it. Meyers’ works in the current exhibition represent the two sides of her work – drawings made in private in her studio and those made on walls in public places. Her studio drawings are drawn with ink applied to a transparent plastic called Mylar. This allows light to shine through the drawing and reflect off the white sheet behind it, bringing luminosity to the work. Meyers’ drawings on Mylar are often large, but they are made in private in her studio in a quiet Washington, D.C. neighborhood. The beautiful map-like webs of lines emerge during solitary hours of concentration when Meyers’ only companion may be her dog. If the artist begins such a drawing and isn’t happy with it, she can change it or destroy it. She has the privacy and control most artists take for granted. The other side of Meyers’ creation is anything but private and it may threaten to escape her control. She is best known for her colossal drawings made on walls in such public places as art museums and galleries. The conceptual artist Sol Lewitt was one of the pioneers of wall drawings. He often created indirectly, having others make drawings from his directions. Lynn Meyers, by contrast, must create directly. Her immediate experience of drawing is central to her work. She comes to her wall drawings with a plan in mind that she has worked out in a series of preparatory drawings. But once she has put simple guidelines on the walls outlining the basic shapes of the compositions, the works evolve freely. Line responds to line; every waver of her hand is reflected in the next line. This process may lead the final work in directions the artist did not anticipate before she interacted with the wall itself. The current exhibition includes three preparatory drawings for Meyers’ wall drawing created in 2010 at the Phillips Collection in Washington, D.C., At the Time Being. Comparing these three small drawings with the monumental results as recorded in videos helps the viewer to appreciate how the artist has improvised like a jazz musician, responding to momentary thoughts and feelings. Indeed, Meyers’ wall drawings are, in part, performance. She often draws in full view of the public for long hours on successive days. The experience is reminiscent of tight-rope walking. If she were to falter and lose focus, it would be a most public failure. She goes forward with this risk in mind. Her wall drawings require a bravery we do not generally associate with the medium of drawing. Most of Meyers’ wall drawings are designed to be ephemeral; once they have been completed, the artist walks away. Her mission has been accomplished. The wall drawings are shown for a season, and then destroyed. Nothing remains but preparatory drawings and photographic documentation. Meyers is often filmed while she is making a wall drawing. The videos that remain, many available on the internet, exist as the ghostly reflections of the effaced works and the time Meyers spent in drawing them.